[ABOVE] Portrait of the Artist. A self portrait by Frederick Oakes (Devereux), signed and dated on the reverse "F. Oakes,1867". (Oil on canvas). 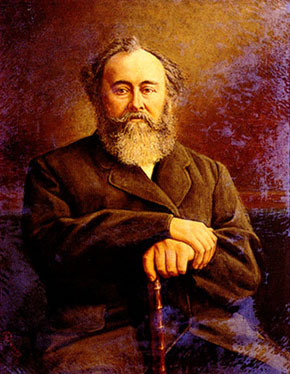 Frederick Oakes did not adopt the surname of Devereux until about 1872. [ABOVE] Selina, Wife of the Artist. A portrait by Frederick Oakes (Devereux), dated 1870. (Oil on canvas). This portrait was painted the year Frederick Oakes married Mrs Selina Sharman (nee Southwell). This portrait and the self portrait by Frederick Oakes was presented to Brighton Museum and Art Gallery in 1949 by Miss Lucy Sharman, the daughter from Mrs Selina Oakes' first marriage. [ABOVE] A portrait of James White M P (1809-1883) by Frederick Oakes Devereux. James White was MP for Plymouth during the period 1857 to 1859. 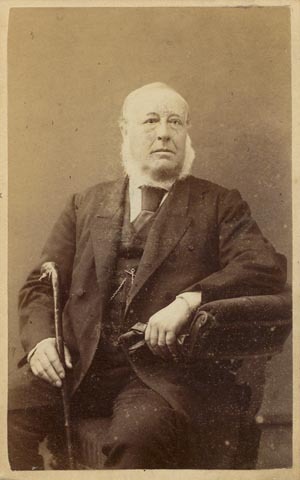 In 1860, White was elected Liberal MP for Brighton and served as the town's Member of Parliament until 1874. The portrait was probably painted after 1872, the year Frederick Oakes adopted the surname of Devereux. [ABOVE] The trade plate of Frederick Oakes Devereux, Artist in Photography (c1890). Frederick Oakes adopted the surname of Devereux when he became a professional photographer in 1872. Frederick Oakes Devereux was born in Liverpool in 1840. His real name was Frederick Oakes and he was the son of Ann and John Wright Oakes of Liverpool. Frederick Oakes was baptised at St Peter's Church, Liverpool on 8th July 1840. 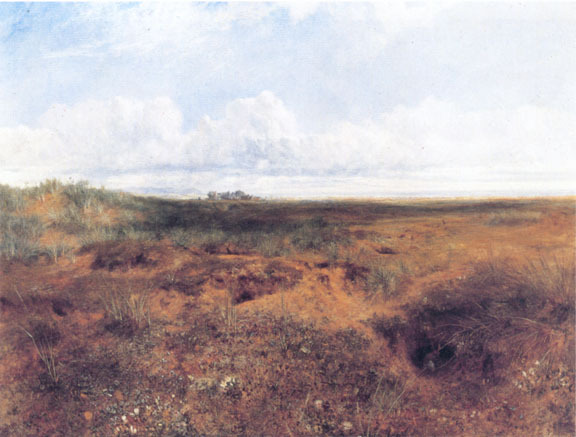 John Wright Oakes, Frederick's father, was a distinguished landscape painter and was an associate of a number of eminent Victorian artists, including John Everett Millais (1829-96) and James Abbott McNeill Whistler (1834-1903). John Wright Oakes and his wife Ann (born c1822, Liverpool), a corset maker by trade, produced three children during their marriage. 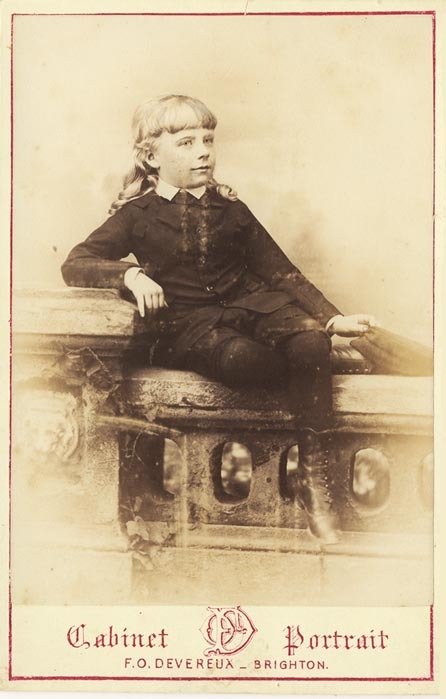 Frederick Oakes was the eldest child and he had two younger sisters - Emily Frances Oakes (born 1842, Liverpool) and Lucy Clementine Oakes (born 1844, Liverpool), who died in the Kensington district of London in 1872 at the age of 28. At the time of the 1851 census, John Wright Oakes and his family were living at 2 Dover Street, Liverpool. On the census return, John Wright Oakes is described as an "Artist & Landscape Painter" and his wife gives her occupation as "Corset Maker". John Wright Oakes, Frederick Oakes Devereux's father, was born at Sproston House, near Middlewich, Cheshire, on 9th July 1820. John Wright Oakes trained as an artist in Liverpool and eventually became a member of the Liverpool Academy. Early in his career, Oakes was identified as a Pre-Raphaelite landscape painter but he later abandoned this style of painting. Oakes exhibited his landscape paintings at various London exhibitions and in 1859 he settled in London with his family. John Wright Oakes mainly painted in oils, but he did occasionally produce watercolours and etchings. His favourite landscape subjects were desolate moors and heaths and the mountain scenery of Wales and Scotland. 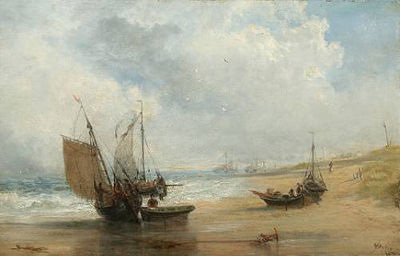 Oakes also painted a number of beach scenes. John Wright Oakes exhibited regularly at the Royal Academy. Oakes was made an Associate of the Royal Academy in 1876 and an honorary Royal Scottish Academician in 1883. John Wright Oakes died at his home at Leam House, Addison Road, Kensington, London, on 8th July 1887 and he is buried in Brompton Cemetery. Works by John Wright Oakes can be found in a number of British public collections, including the Victoria & Albert Museum, London, Glasgow Art Gallery & Museum and the Walker Art Gallery, Liverpool. In 1859, when Frederick Oakes was aged around nineteen, his family moved from Liverpool to London. As a teenager, Frederick Oakes probably received some instruction in the art of painting from his father, John Wright Oakes. However, Frederick Oakes did not become a landscape painter like his father and later worked professionally as a portrait artist. The 1861 census records Frederick Oakes and his family at 28 Victoria Road, Kensington, London. The census enumerator describes the profession of the Head of the household as "Artist - Landscape", while his teenage son is recorded as a "Student Artist", which suggests Frederick Oakes was receiving some formal training at a London art school. By the late 1860s, Frederick Oakes was earning a living as a portrait painter in Brighton. Brighton Museum & Art Gallery has in its art collection two oil paintings by Frederick Oakes; one is a self portrait entitled "Portrait of the Artist", signed and dated on the reverse - "F. Oakes,1867", the other is a portrait of Mrs Selina Oakes and carries the title "Selina, Wife of the Artist, 1870". Frederick Oakes married Mrs Selina Sharman (nee Southwell) at St Nicholas' Church, Brighton on 24th July 1870. 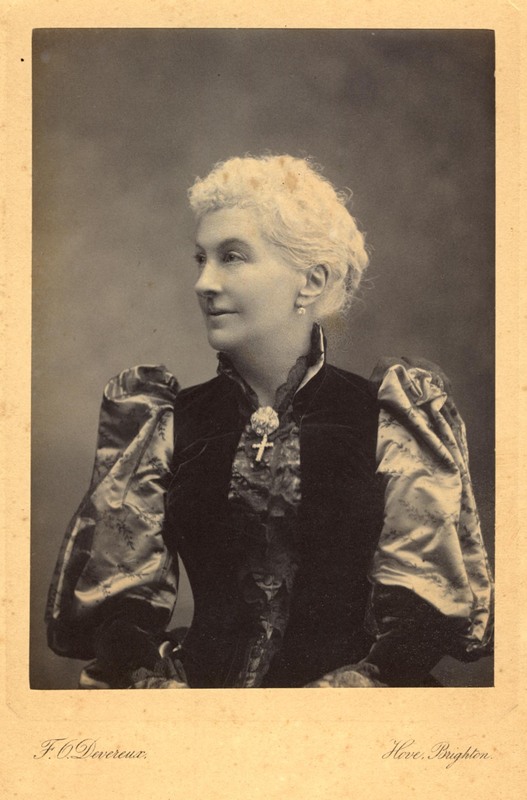 Selina Southwell was born on 6th December 1838 in Marylebone, London, the daughter of Elizabeth and William Southwell, a pianoforte maker. 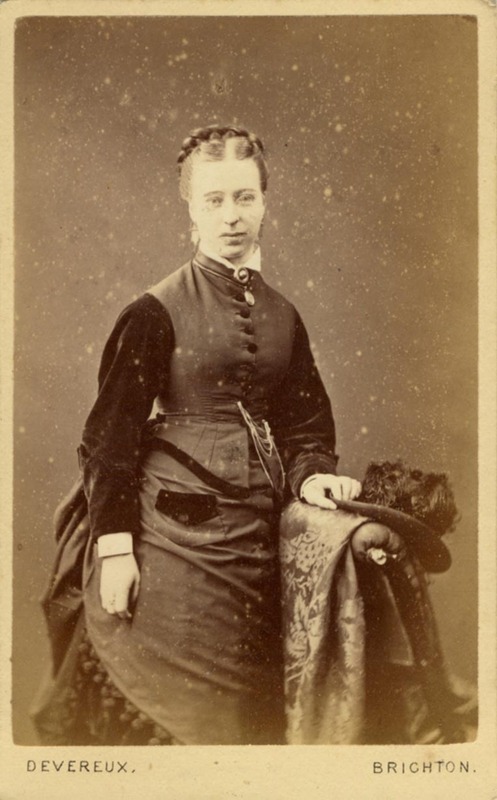 Selina was a younger sister of three London photographers - William Henry Southwell (1823-1870), Edwin Southwell (1832-1882) and Frederick Southwell (1833-1883), who together in the early 1860s had formed the successful London photography firm of Southwell Brothers. In 1864, Selina Southwell married Henry Sharman [marriage registered in the district of Chelsea during the Third Quarter of 1864]. A child, a daughter named Lucy Sharman (born 1865, Chelsea), was produced from this union, but it appears that Selina's husband died soon after Lucy's arival in the world. The young widow, together with her infant daughter, travelled down to Brighton, where she went on to marry Frederick Devereux in 1870. When the census was taken on 2nd April 1871, Frederick Oakes and his wife Selina were living at 26 Castle Street, Brighton. Frederick Oakes is described on the census return as an "Artist - Portrait Painter", aged 31. 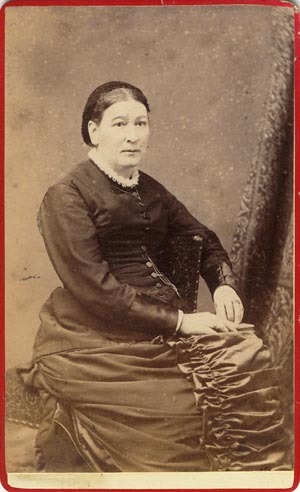 Mrs Selina Oakes, his wife, gives her occupation as "Photographic Colourer", which indicates that she too had some artistic talent and that the couple already had connections with the photographic studios of the town. 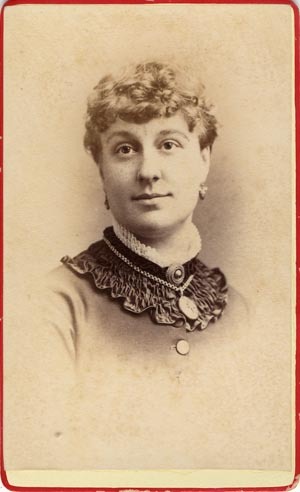 Lucy Sharman, Selina's daughter from her first marriage, was staying elsewhere in Brighton when the 1871 census was carried out. [ABOVE] A trade plate produced by Frederick Oakes under his professional name of Frederick Oakes Devereux (c1877). 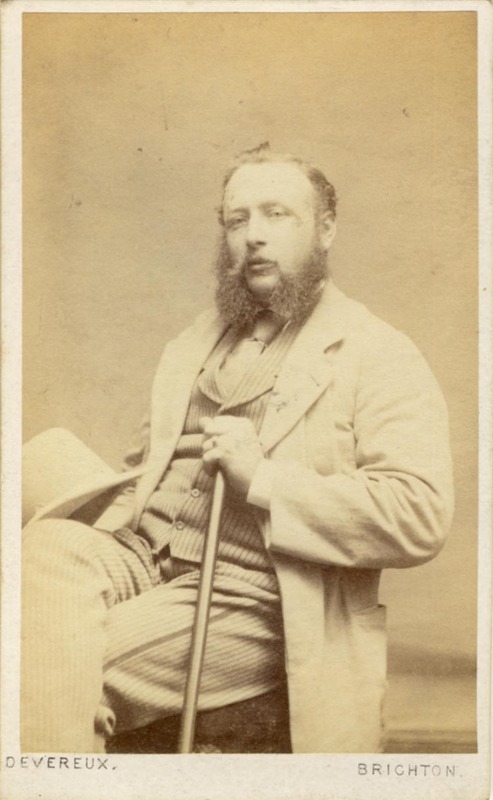 Although he was christened "Frederick Oakes" on 5th July 1840, the artist decided to use the distinguished surname of Devereux after he switched his main occupation from portrait painter to photographer in 1872. When he died in Hove in 1912, his death was registered in the district of Steyning under the name of Frederick Oakes Devereux. Frederick's wife Selina had become Mrs Selina Oakes when she married Frederick Oakes in 1870, yet when she died in 1922, her death was also registered under the surname of Devereux. The couple's daughter, who was born in 1877, was given the name of Leonora Devereux Oakes. On 21st March 1893, the sixteen year old was re-christened "Leonora Devereux", but when she died in 1908 at the age of thirty-one, her death was registered under the surname of Oakes. 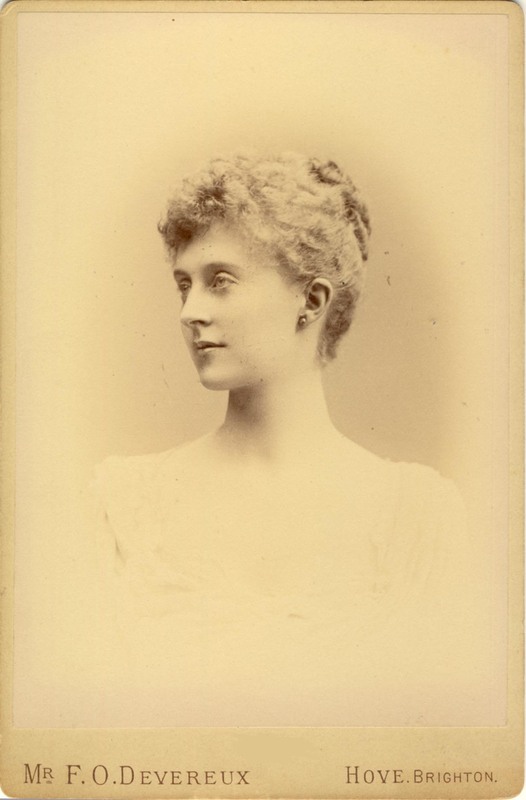 Frederick Oakes Devereux's step daughter Lucy Sharman (Selina's child from her first marriage) was also re-christened with the surname "Devereux" in 1893, but she chose to be known as Miss Lucy Sharman in later life. Surviving carte-de-visite portraits by Frederick Oakes Devereux, which carry the studio address of 33 West Street, Brighton, indicate that Frederick Oakes was taking photographic portraits in Brighton as early as 1872. 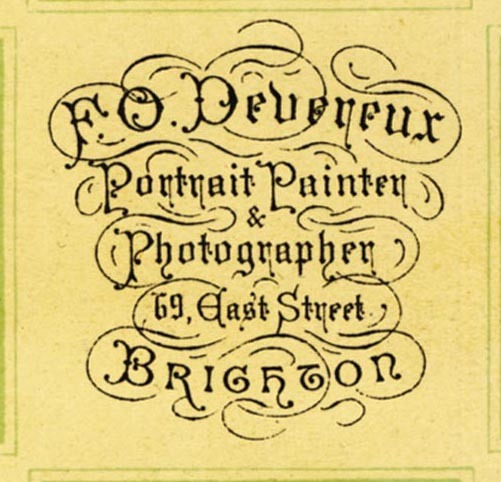 A local trade directory of 1873, lists F. O. Devereux as a photographic artist at 30 East Street, Brighton, but this business address was possibly a typographical error. 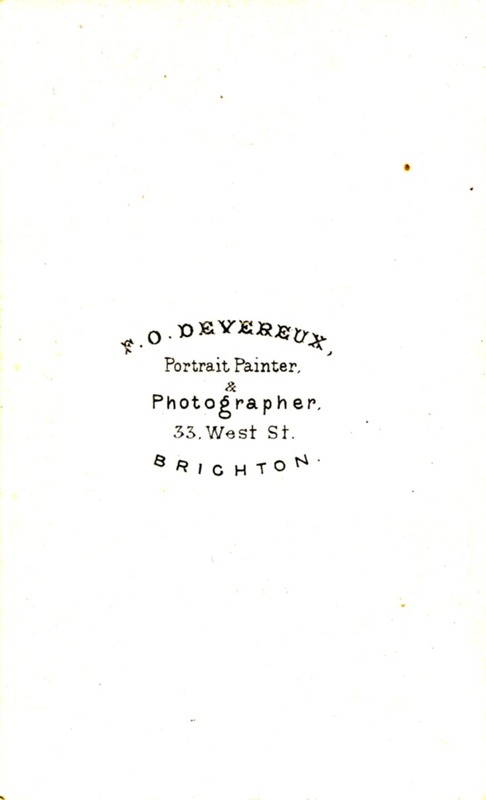 Page's Brighton Directory of 1873, lists "O. Devereux" as a photographic artist with a studio 69 East Street, Brighton, so Devereux probably vacated the West Street studio before the end of 1872. Brighton's East Street was a fashionable shopping area during the 19th century. 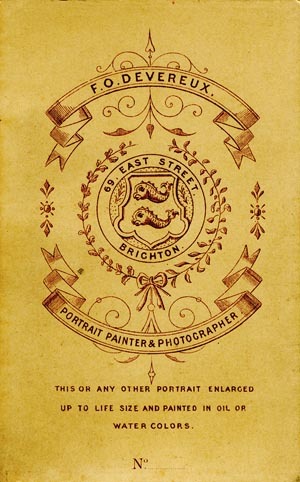 In 1861, a photographic portrait studio had been established at 69 East Street, Brighton by two brothers, Alfred White, a photographer, and William White, an artist and portrait painter. Around 1868, the White Brothers sold their studio to Edwin Dalton Smith, another artist and photographer. The photographic studio at 69 East Street was acquired by Frederick Oakes Devereux around 1873. Situated next door to F. O. Devereux's premises at No. 69 was the successful studio of W. & A. H. Fry of 68 East Street, Brighton. The two brothers, Walter Henry Fry (born 1841, Plymouth) and Allen Hastings Fry (born 1847, Plymouth) had established their studio at No. 68 East Street in 1867 and Allen Hastings Fry was still in business at this address in 1922. During the 1870s, Frederick Oakes Devereux described himself as a "Portrait Painter & Photographer". Apart from a portrait in oils of James White, M P (1809-1883), which was signed by Frederick Oakes Devereux and painted around 1872, very few original painted portraits by F. O. Devereux are known. The publicity on the reverse of the cabinet and carte-de-visite photographic portraits produced by F. O. Devereux in the mid 1870s, proclaim that "Mr. F. Oakes Devereux, Portrait Painter and Photographer" of 69 East Street, Brighton was a "Silver Medallist of the Royal Academy", but it is likely that the majority of the portraits painted in his studio in East Street were created on the base of his photographic work. An announcement printed on the back of carte-de-visite photographs produced in his East Street studio during the mid 1870s, informed the customer that "this or any other portrait" could be "enlarged up to life size and painted in oil or water colors". This was a common practise by portrait photographers who had previously worked as professional artists, but had turned from portrait painting to photography. Large firms such as John J. E. Mayall's studio at 90 & 91 King's Road, Brighton could afford to employ professional artists to paint over enlarged photographic portraits. [ An advertisement for Mayall's New Photographic Portrait Studio in Brighton, which opened in July 1864, announced that "Mr Mayall ...has engaged the most talented Artists to finish his portraits in oil colours, water colours, India ink &c.". Mayall's studio charged between six guineas (�6. 6s) and eighteen guineas (�18. 18s) for his "Oil Colour Portraits" ; a "Life Size" Portrait painted "in Oils" would cost the customer between twenty-five guineas and fifty guineas (�52.10s) ]. Frederick Oakes Devereux and his wife Selina, a professional "photographic colourer", had the artistic talent to finish their own photographic portraits in oil colours and water colours and their charges were probably more moderate. [ABOVE] A view of Brighton's East Street (c1905). Frederick Oakes Devereux's studio at 69 East Street was situated next door to the premises of W. & A. H. Fry, a photography firm that had been in business at No.68 East Street since 1867. The awning behind the sign "FRY PHOTOGRAPHER" at centre-right of the picture, indicates the site of Devereux's studio in East Street. Frederick Oakes Devereux acquired the studio of artist and photographer Edwin Dalton Smith at 69 East Street, Brighton around 1873. Frederick Oakes Devereux remained at 69 East Street until about 1882, when he moved his business to Hove. [ABOVE] The trade plate of Frederick Oakes Devereux, Portrait Painter & Photographer, 33 West Street, Brighton (c1872). The artist Frederick Oakes established a photographic portrait studio at 33 West Street, Brighton around 1872. The following year, F. O. Devereux transferred his business to 69 East Street, Brighton. [ABOVE] A carte-de-visite portrait of a seated man by Frederick Oakes Devereux, Portrait Painter & Photographer, 33 West Street (c1872). In the 1870s and early 1880s, Frederick Oakes Devereux styled himself as a "Portrait Painter & Photographer". 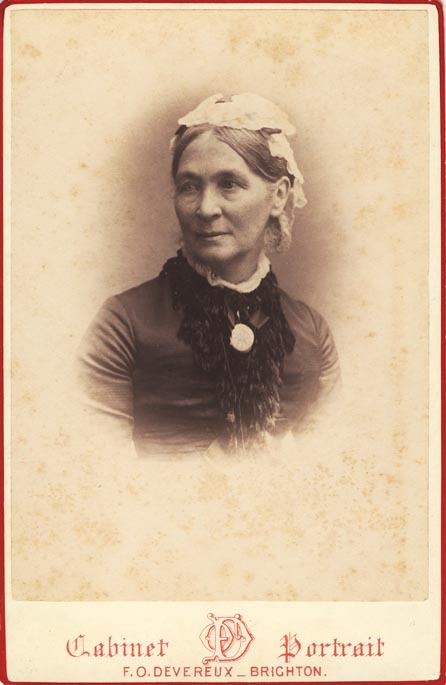 According to Devereux's publicity, small carte-de-visite portraits such as this one (measuring 6 cm x 9.5 cm) could be "enlarged up to life size and painted in oil or water colors". 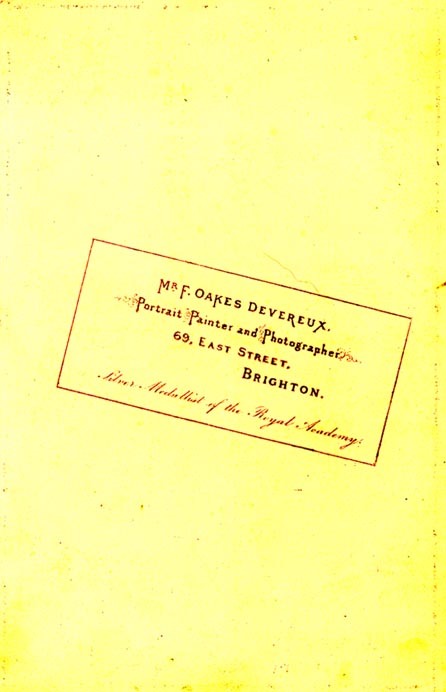 [ABOVE] Frederick Oakes Devereux listed as a photographer at 69 East Street, Brighton, in Kelly's Directory of Sussex, published in 1878. The long established photographic studio of W. & A. H. Fry was next door to Devereux's studio in East Street. 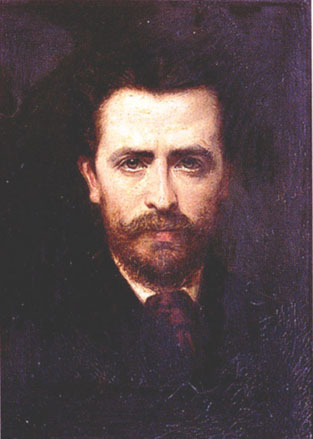 In the late 1860s, Frederick Oakes Devereux had worked as a portrait painter under his real name of Frederick Oakes. 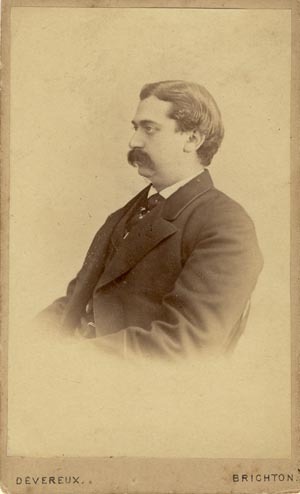 After he had established himself as a professional portrait photographer in Brighton in 1872, Frederick Oakes changed his name to Frederick Oakes Devereux. For a decade or more, Frederick Oakes Devereux styled himself as a "Portrait Painter & Photographer" and it was only after his move to Hove that he dropped the term "Portrait Painter" from his publicity. The trade plate Illustrated on the left (taken from a carte-de-visite portrait produced around 1875) is in the form of a visiting card and describes Mr. F. Oakes Devereux as a "Portrait Painter and Photographer" and informs the public that he was a "Silver Medallist of the Royal Academy". It appears that Frederick Oakes Devereux did not exhibit painted portraits in major galleries and exhibitions after 1875 and any portraits painted in his studio at 69 East Street, Brighton were based on the photographic portraits he took with his camera. The publicity printed on the reverse of carte-de-visite portraits photographed in his East Street studio during the mid 1870s, informed the purchaser of the photograph that "this or any other portrait" could be "enlarged up to life size and painted in oil or water colors". [see centre illustration below]. Several professional portrait painters who established photographic studios in Brighton in the 1860s and 1870s offered this service. Samuel Robert Lock (1822-1881), an artist who had exhibited paintings at the Royal Academy between 1849 and 1854, was a partner in the firm of Lock & Whitfield, which operated as "Photographers and Miniature Painters" at 109 Kings Road, Brighton, between 1864 and 1885. The well known artist and portrait painter Lowes Cato Dickinson (1819-1908) was a partner in the photographic firm of Dickinson Brothers, which ran a photographic portrait studio in Brighton's Kings Road between 1862 and 1868. Other portrait painters who worked as studio photographers in Brighton include Richard Jeffray (1816-1896), Camille Langlois junior (born c1812 Paris), Albert Adolphe Boucher (1841-1875), Stephen Grey (1823-1891), Edwin Dalton Smith (1800-1883) and William Abery White (1831 -1874). After seven years of marriage, Frederick Oakes Devereux and his wife Selina became parents of a baby girl. Their daughter Leonora Devereux Oakes was born in Brighton during the 3rd Quarter of 1877. 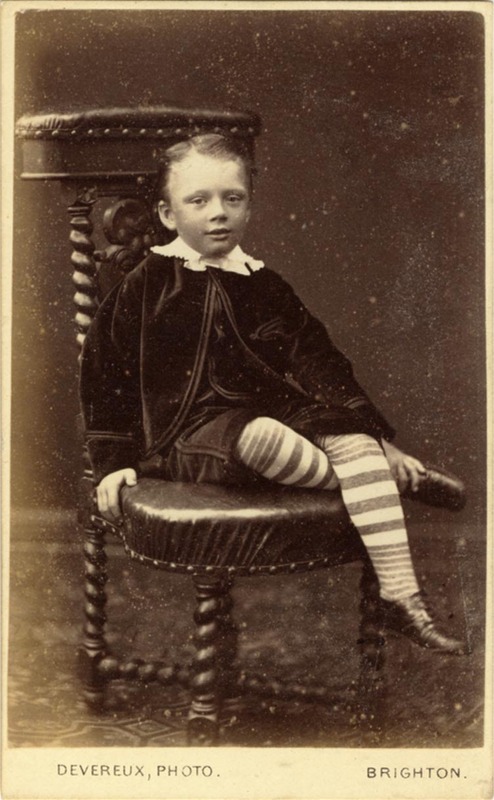 In the Spring of 1879, Frederick's wife gave birth to a baby boy named Edwin Devereux Oakes, but he did not survive infancy. [The death of Edwin Devereux Oakes was registered in Brighton during the First Quarter of 1880]. When the 1881 census was taken, Frederick, his wife Selina and their two surviving children were recorded in the living quarters attached to F. O. Devereux's photographic studio at 69 East Street, Brighton. Although the family's legal surname was "Oakes", Frederick, his wife Selina, and her daughters Lucy and Leonora, are listed on the census return with the surname of Devereux. Frederick Devereux is described on the census return as a forty year old "Photographer". Frederick Devereux's step-daughter, fifteen year old Lucy Sharman, is recorded as "Lucy Devereux". Frederick's young daughter Leonora, whose name at birth was registered as Leonora Devereux Oakes was re-christened "Leonora Devereux" on 21st March 1893, when she was sixteen years of age. However, when Leonora died in 1908, at the age of thirty-one, her death was registered under the surname of Oakes. At the same re-christening ceremony in March 1893, Frederick Oakes Devereux's step daughter Lucy Sharman (Selina's child from her first marriage) was also re-christened with the surname "Devereux", but in later life she preferred to be known as Miss Lucy Sharman. [ABOVE] Details of the portrait photographer Frederick Oakes Devereux and his family in the 1881 census return for 69 East Street, Brighton. 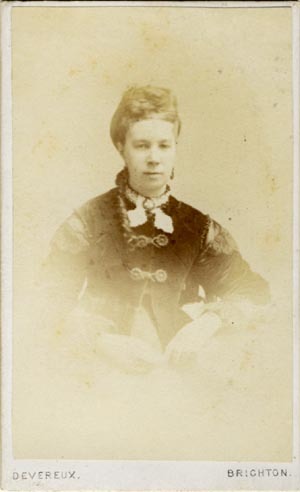 Lucy Devereux (born Lucy Sharman in 1865) was Frederick Oakes Devereux 's step daughter. 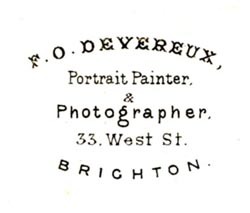 By 1883, Frederick Oakes Devereux had moved his photography business from Brighton to Hove, establishing a photographic portrait studio at 5 Lansdowne Terrace East, Western Road, Hove. Lansdowne Terrace was a line of houses built at the far end of Western Road, Hove, between Farm Road and Lansdowne Place. The buildings of Lansdowne Terrace East and Lansdowne Terrace West occupied a stretch of Western Road between the Wick Inn at No. 53 and the London & County Bank at No. 65 Western Road, Hove. By 1888, the houses and shops of Lansdowne Terrace had been absorbed by Western Road and re-numbered. The building at No. 5 Lansdowne Terrace East became known as 61 Western Road, Hove. 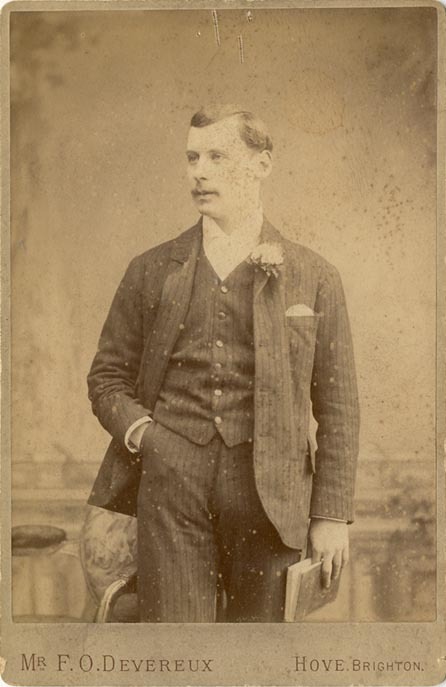 During the twenty-five years or so that Frederick Oakes Devereux was based in Western Road, Hove, his photographic output was almost exclusively in the field of studio portraiture. 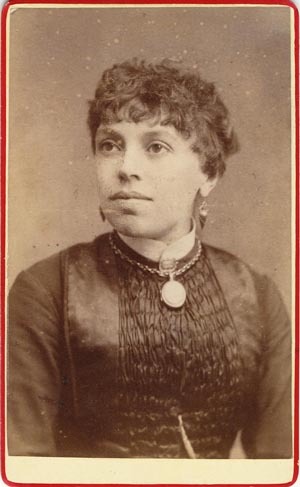 In the 1880s and 1890s, F. O. Devereux mainly produced photographic portraits in the two most popular formats - the small carte-de-visite portrait and the larger cabinet print. 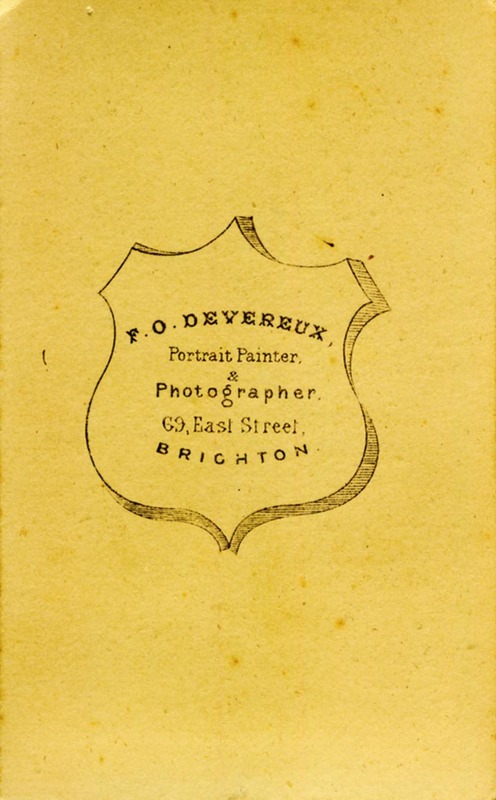 Although other photographers in Brighton and Hove took on "outdoor photography", taking their camera on location to record wedding parties, sports teams, etc., or take photographic views of notable buildings or private residences, Devereux appears to have been content to remain in the confines of his portrait studio. Even when F. O. Devereux was commissioned to photograph Hove Swimming Club's Water Polo Team to commemorate the team's success as "Junior Champions of Sussex" for the year 1896, he chose to picture the seven players in their swimming costumes, sitting and standing between the drapes of his portrait studio and flanked by the well-dressed officials of Hove Swimming Club. [The group portrait of the Hove Swimming Club's Water Polo Team taken at F. O. Devereux's studio at 98 Western Road, Hove, can be viewed at the My Brighton and Hove website by searching the words "Water Polo 1896"]. 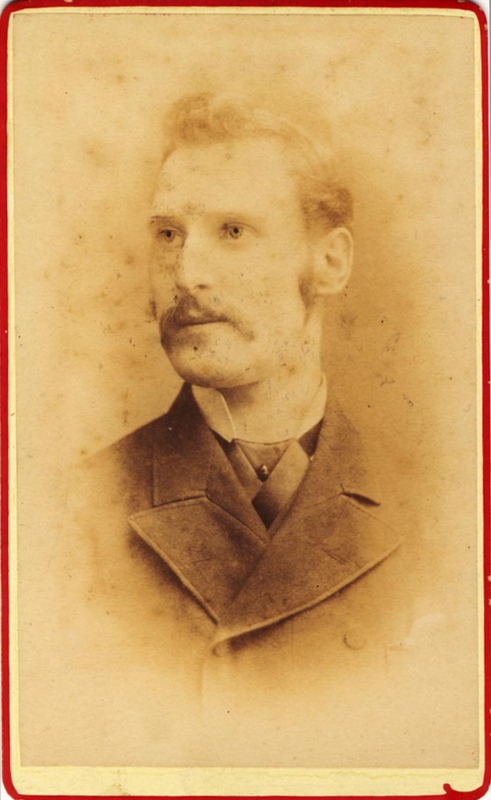 [ABOVE] A carte-de-visite portrait of a man by Frederick Oakes Devereux, photographer, of 5 Lansdowne Terrace East, Western Road, Hove (c1885). By 1888, Lansdowne Terrace had been absorbed by Western Road, Hove, and Devereux's studio address had to change to 61 Western Road, Hove. Around 1893, Devereux had to change his business address yet again, because the construction of new buildings in Western Road necessitated the re-numbering of the existing buildings. 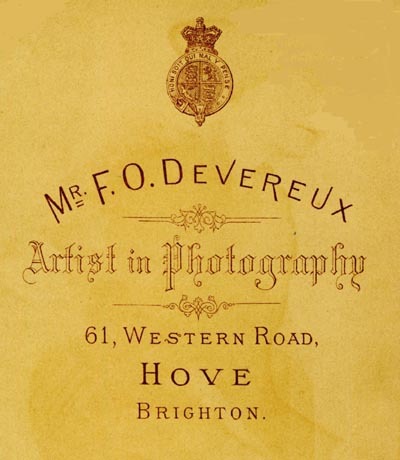 From 1893 until 1924, the studio address of F. O. Devereux was given as 98 Western Road, Hove. 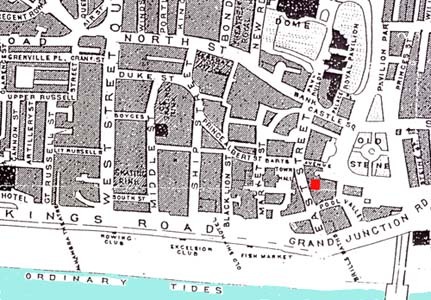 [ABOVE] A Victorian map of Brighton showing the location of Frederick Oakes Devereux's photographic studio at 69 East Street (marked with a red square). A rival photographic firm, W. & A. H. Fry were situated next door at No. 68 East Street. 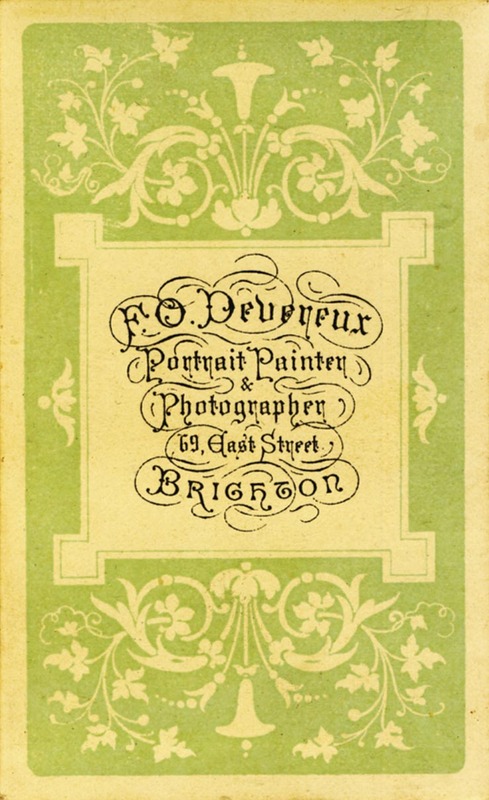 By 1883, F. O. Devereux had re-located his studio to Western Road, Hove. [ABOVE] An Edwardian map of Hove showing the location of Frederick Oakes Devereux's photographic studio at 5 Lansdowne Terrace East (marked with a red dot). By 1888, the studio was known as 61 Western Road, Hove. Around 1893, the buildings in this stretch were re-numbered and F. O. Devereux's studio address became 98 Western Road, Hove. [ABOVE] The reverse of the carte-de-visite portrait pictured on the right showing the photographer's trade plate in the form of a visiting card. 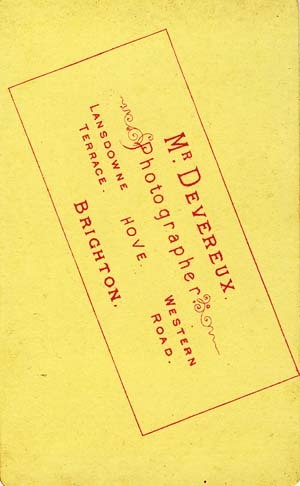 The card gives details of Mr Devereux, Photographer, Lansdowne Terrace East, Western Road, Hove, Brighton (c1885). 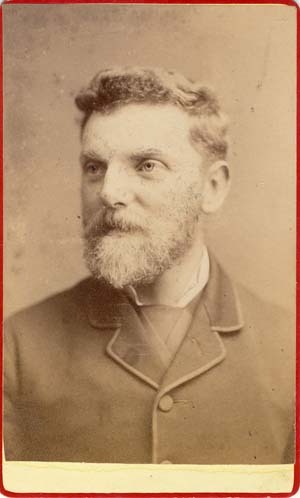 [ABOVE] A carte-de-visite portrait of a bearded man by Frederick Oakes Devereux, photographer, of 5 Lansdowne Terrace East, Western Road, Hove (c1885). By 1888, Lansdowne Terrace had been absorbed by Western Road, Hove, and Devereux's studio address had to change to 61 Western Road, Hove. [ABOVE] A cabinet portrait of a man holding a book photographed by Frederick Oakes Devereux of 61 Western Road, Hove (c1890). Negative No. 15,165. [ABOVE RIGHT] A cabinet portrait of Mrs Constance Mary Elliott photographed by Frederick Oakes Devereux of 61 Western Road, Hove (c1888). Mrs Constance Mary Elliott was the wife of Reverend George Luther Lake Elliott (1849-1891), the vicar of Bowden Hill, Chippenham, Wiltshire. Miss Constance Mary Elmslie married Reverend George Elliott in 1876, when she was 19. 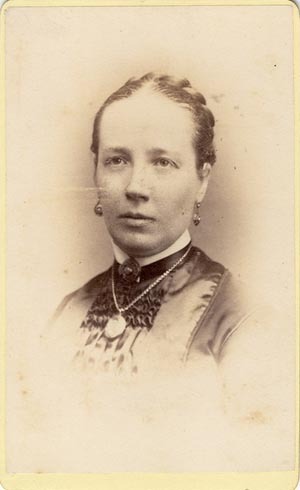 Constance Mary Elmslie, the daughter of James Augustus Elmslie and Mary Johanna Baumgardt, was born on 5th February 1857 in Paddington, London. 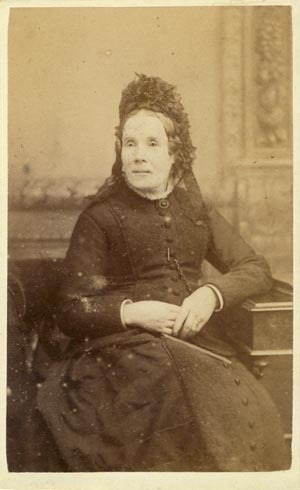 Mrs Constance Elliott was aged about thirty when this photograph was taken around 1888. Reverend George Elliott, Constance's husband, died in 1891 in his early forties. At the end of the following year, on 29th December 1892, the thirty-five year old widow married Major General Charles Benjamin Knowles, Commander of Armed Forces in Malta. [ABOVE LEFT] The reverse of the cabinet portrait of Mrs Constance Mary Elliott photographed by Frederick Oakes Devereux, Artist in Photography, 61 Western Road, Hove. Even though the mount has been inscribed "Constance Mary Elliott, circa 1886", the portrait actually dates from around 1888, when F. O. Devereux's studio at 5 Lansdowne Terrace was absorbed into Western Road. The buildings in this stretch of Western Road were re-numbered and Devereux's studio in Lansdowne Terrace assumed the new address of 61 Western Road, Hove. [ABOVE] Frederick Oakes Devereux listed as a photographer at 61 Western Road, Hove, in the 1890 edition of Kelly's Directory of Sussex. 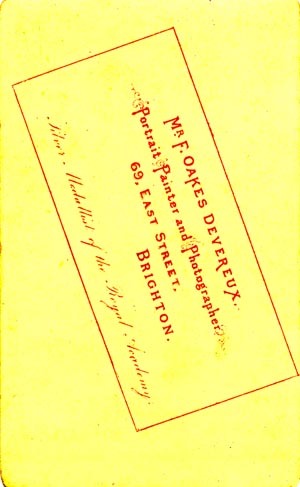 Although it appears from his changing studio address that Frederick Oakes Devereux moved his business every six years, in fact, he operated a photographic portrait studio from the same premises in Western Road, Hove, for over twenty-five years. It was not that Frederick Oakes Devereux was constantly moving the location of his studio, it was just that the re-development of Hove's Western Road required him to change the form of his address over a thirty year period. During the period 1883 to 1924, F. O. Devereux's business address was given, first, as No. 5 Lansdowne Terrace East, secondly, as 61 Western Road, Hove, and finally as 98 Western Road, Hove, yet from 1883 until his death in 1912, Frederick Oakes Devereux stayed put in the same photographic studio in Western Road, halfway between Lansdowne Place and Farm Road, Hove. [ABOVE] Frederick Oakes Devereux's changing studio address in Western Road, Hove. 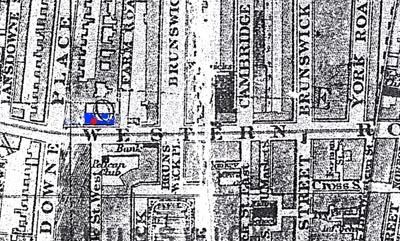 The location of Devereux's studio was constant, but Devereux's address changed as Western Road was developed. [ABOVE] Frederick Oakes Devereux listed as a photographer at 98 Western Road, Hove, in the 1911 edition of Kelly's Directory of Sussex. [ABOVE] Portrait of an unknown woman, a large format photograph by Frederick Oakes Devereux of Hove (c1898). Negative No. 15,765. By the time this portrait was taken, F. O. Devereux's studio address had been re-numbered from No. 61 Western Road to No. 98 Western Road, Hove. Frederick Oakes Devereux was in business as a photographer in Brighton from 1872 until his death in 1912. 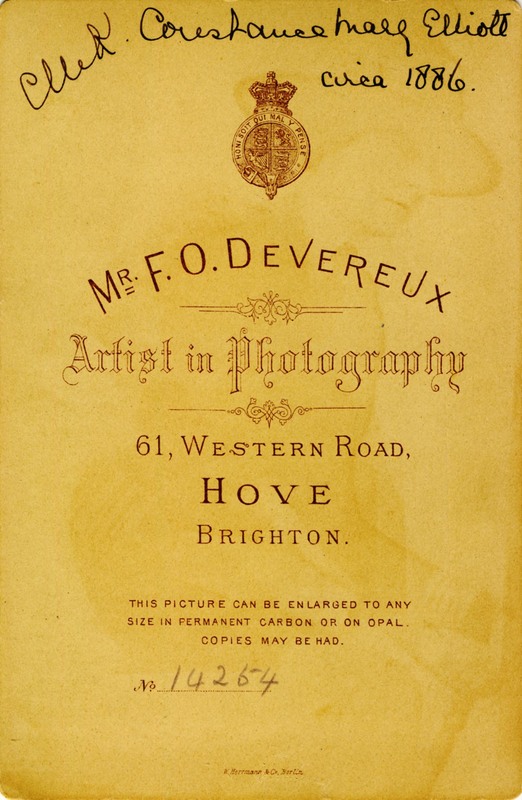 For the first ten years of his long photographic career, Frederick Oakes Devereux was based in central Brighton, but from 1883 until 1912, Devereux was the proprietor of a photographic portrait studio in Western Road, Hove. Frederick Oakes Devereux died at his home at 68 Denmark Villas, Hove, on 13th January, 1912, at the age of seventy-one. 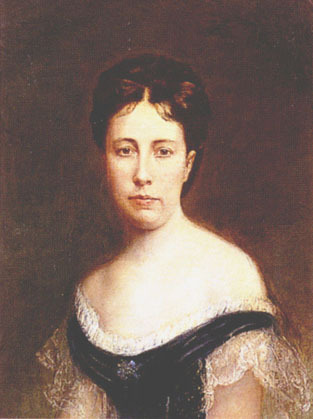 Frederick's widow Mrs Selina Devereux died in Hove early in 1922, aged 82. [Death registered in the District of Steyning during the First Quarter of 1922]. Frederick and Selina's daughter, Miss Leonora Devereux Oakes, had died in 1908 at the age of thirty-one, but her half-sister Miss Lucy Sharman lived well into old age and was apparently still alive in 1949, the year she donated portraits of her mother and step-father to Brighton Museum & Art Gallery. The photographic studio at 98 Western Road, Hove carried the name of Frederick Oakes Devereux until the mid 1920s. 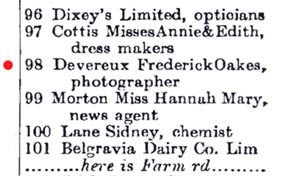 ( The trades section of Kelly's 1924 Directory of Sussex includes Frederick Oakes Devereux of 98 Western Road Hove, Brighton, in its list of professional photographers ). [ABOVE] Extracts from Kelly's Brighton & Hove Street Directory in 1890 (left) and 1911 (right), showing Frederick Oakes Devereux's unchanging position (but changing house number) in the stretch of Hove's Western Road between Lansdowne Place and Farm Road. [ABOVE] A photograph, dating from about 1910, showing the stretch of Western Road, Hove, between Brunswick Place and Lansdowne Place. Frederick Oakes Devereux's photographic studio was located in the row of light-coloured buildings to the right of the lamp post, bounded by Farm Road at the centre of the picture, marked by the sign for Belgravia Dairy Ltd. This row of buildings in Western Road was known as Lansdowne Terrace East until about 1888, when the terraced buildings were absorbed by Western Road and re-numbered. Frederick Oakes Devereux's premises at No. 5 Lansdowne Terrace East became 61 Western Road, Hove. In 1892, the buildings in this stretch of Western Road were re-numbered again to accommodate the new buildings erected on the gardens of Brunswick Place. 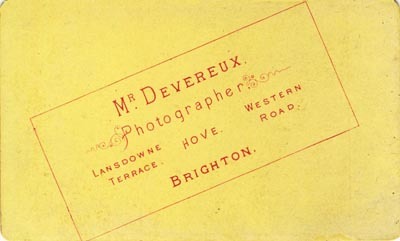 Devereux had to change his studio address once again, this time from No.61 Western Road to No.98 Western Road, Hove. Today, 98 Western Road, Hove, is the site of a ladies' hairdressing salon. The spire of the Church of St John the Baptist can be seen In the distance. (see MAP below). [ABOVE] An Edwardian map of Hove showing the location of Frederick Oakes Devereux's photographic studio in Western Road, Hove. 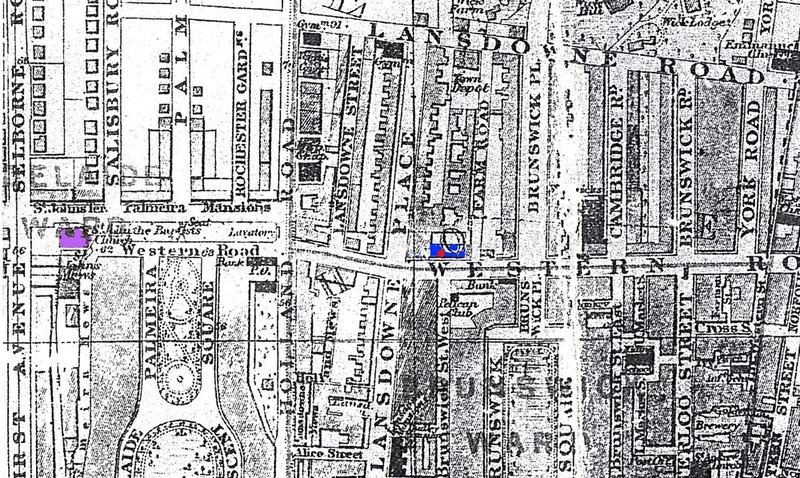 Frederick Oakes Devereux's studio (marked with a red dot ) was located in a row of buildings in Western Road known as Lansdowne Terrace East (marked with a blue rectangle), situated between Lansdowne Place and Farm Road. When Western Road was developed during the late 1880s, Lansdowne Terrace East was absorbed by Western Road. The address of Frederick Oakes Devereux's premises at 5 Lansdowne Terrace East was changed to 61 Western Road, Hove around 1888. Devereux's studio address changed again when the buildings in this part of Western Road were re-numbered in the early1890s following re-development. 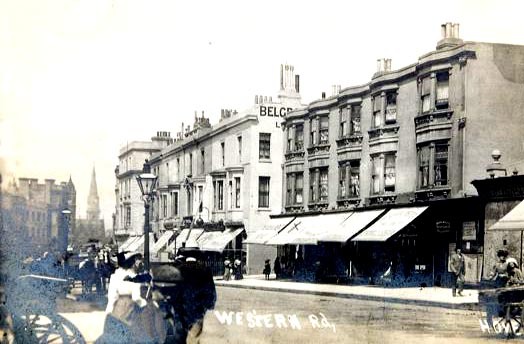 In 1893, Devereux's studio address had to change from No.61 Western Road to No.98 Western Road, Hove. The spire of St John the Baptist's Church, Hove (marked with a purple rectangle ) can be seen in the distance in the photograph of Western Road, Hove, shown above. Thanks to David Cripps of Tasmania for providing family history details of the Oakes Family and the Family of Selina Southwell, the wife of Frederick Oakes Devereux. I am grateful to photoLondon for providing information on the Southwell Brothers on The Database of 19th Century Photographers and Allied Trades in London: 1841-1901 (based on the research of David Webb) which is featured on the photoLondon website. Thanks also to Paul Frecker for his research into the Southwell Family and the family's involvement in 19th Century Photography. I would also like to thank John Southwell for providing details of Frederick Oakes Devereux's death and his last residence in Hove. John Southwell is related to the Southwell family. Thanks to Allan Oakes of Liverpool for sorting out the confusion between John Wright Oakes, the landscape painter, and John Oakes, a Liverpool policeman, who is featured on Allan's family tree. OTHER SOURCES : Books : A Directory of London Photographers, 1841-1908 compiled by Michael Pritchard (PhotoResearch 1986, 1994); The Public Catalogue Foundation : Oil Paintings in Public Ownership - East Sussex & West Sussex (PCF, 2005 ) ; Websites : Cripps/ Burchett/ Southwell Pedigrees on rootsweb ; Records of Baptisms & Marriages ( IGI ) on Family Search website ; Registers of Births, Marriages & Deaths at the FreeBMD website ; Database of 19th Century Photographers and Allied Trades in London: 1841-1901 on the website photoLondon ; The Leicester Galleries website ; The Victorian Web website ; My Brighton and Hove website ; The Royal Pavilion, Libraries & Museums Collections on Brighton & Hove Museums website; Art Catalogue on Brighton & Hove Museums (Virtual Museum) website.